Labor Day is considered the end of summer ... but it's also time to start getting ready for Halloween ... so I have re-enabled commented on the Halloween Blog. I'll be setting up the halloween decorations for a couple of weeks and expect the halloween decorations webcam online around October 1st. Read about what is new for halloween 2008. Here is what the display looked like in 2007 and check out this awesome Halloween 2008 is coming video that "UK Dave" put together! Happy Halloween!!!! Thanks for the Video. Bring it on!!! ready to battle H? I call 50 and 100!! I found your website while looking for Halloween decorations for our Walk the Wicked Woods. We decorate an acre wooded lot with lights and decorations. The kids walk thru a trail collecting candy along the way. Most of my decorations are yardart that I paint myself. Email me if you would you like to see some pictures of it? Yip**! It's here again. We already have Halloween decorations in Asda Walmart. Can't wait for October 1st. Hi to Dave. Thanks Alek, I think I'm getting more excited than Luke. And so it begins. The start of yet another spoooktacular season. Yes, Yes Yes!!! This is gonna be FUN! It's ON Mr Brandon! Great job on the video Mr Dave. Let's get this party started! This year is flying past so fast. Halloween preps already, just doesn't seem possible. Hooray! 57.... and its the weekend! have a good one everybody! Hi All, Hi Gill, Im hoping our local Asda gets there decorations in soon as I want an 8ft inflateable frankenstein for outdoors. They sold out last year before I could get one. Alek replies at 20:25 - Probably not (unless some webcam/video server company offers to ante up for the holiday fun) ... but we'll certainly have some nifty Halloween time-lapse movies. Alek replies at 13:36 - They require that the webcam be attached to a Windoze computer. In my case, the webcam is wireless and has its own IP address. I appreciate the suggestion, but like many that I get, it just won't work for my setup. Wow the years gone so fast!!! The build up to Halloween begins, Did you know that fifteen weeks on thursday is Christmas Day?? Good to see you getting fready for the silly season Alek!! If you dont get lucky Dave, I'd recommend a certain online auction site. We're usually lucky finding what we want, when I want that certain "must have" item that I won't wait for the sales for. I'm a fan of anything halloween with masks and other unique halloween costumes and stuff, that picture of the two kids passing them huge inflatables, their faces...priceless!! Synonymous with Halloween is a full moon ... and we just had a dandy ... was very cool watching from the "Haunted Office" (where webcam3 will be) of the moon setting over the Colorado Rocky Mountains. yeah the watching grass grow webcam is excellent for watching him decorate! in 1 week i'm going to start decorating. are u going to take down the grass webcam or not? Happy Halloween. BOO!!! Hey Everyone, hows it going? I so can't wait for Halloween, but, I won't be spending it with you guys, as I have a date.... soo yeah. PS 46 days! Wow! you live with such stunning views Alek, is that snow on them there mountains already? Hey alek do you think you could spell my name on the lawn with lights when you put out halloween decorations? i would love it. i would be kinda sad if you didn't do it. my name is: Chris Jones. please!!!! I found your site a couple of years ago and just love it. I'm looking forward to the Halloween decorations on cam. Christmas is my favorite though. I love to decorate for the holidays and have thought about starting a holiday decorating business. why are two pieces of wood in the driveway? Oh oh! More lumber on the driveway! The Hulk is on the lawn now, looks like hes started! I noticed political symbols on the right side of the page - is this new? Alek replies at 16:46 - Ski are measured in centimeters - Hulk's are 510's versus my Puny Human 170's! I hope to start putting up the halloween decorations in a few days ... and congrats on post #50.
alek if ur looking 4 another webcam y dont u put it sum where in the house and let the kids decorate the room that its in so there's 2 webcams outside and 2 inside plz send me an email. Hey Alek... Ive been on your webby for like 4 years ! loveing what you do !! How do you get all the electreonics outsie when it rains ? doesnt everything blow ?? Alek replies at 12:50 - The electrical outlets are under cover and/or have weatherproof boxes over 'em. And despite everything being GFI protected, that rarely trips ... unless there is freezing rain which is the worse. I also try to keep each circuit under 10 Amps so as not to overload the fuses. Hey alek XD Is ur long ___) car real ? Alek replies at 09:48 - I've owned the Hulkmobile Delta 88 Convertible since March/1983. There will not be a fourth webcam ... but HEY, isn't three of them enough for 'ya? As noted, I'm hoping to have things fully operational around October 1st - money back refund if that isn't the case! Here's a picture of webcam #2 which looks down on the front lawn. I've installed & turned on webcam1 which looks at the front of the house ... and will be putting the upper roof icicle lights up shortly ... so look for me scrambling around later this morning. Update: Some neighbors were doing their morning walk (see picture of them below from Christmas last year) as I was putting up the first strand of roof lights and said "way to go Alek, our kids look forward to your halloween display every year and we are counting on 'ya!" Alek replies at 11:44 - I'm still in "testing" mode ... but hoping to have everything operational (including the X10 controls to turn stuff on & off) by October 1st - next Wednesday. alek is there any chance u could put the webcam & lights on earlier because of the time delay in england ?? Be careful on the roof and WATCH OUT FOR THE WASPS! That sure is a fine trailer alek, now its gone though you can get up those lights !!!! Why do you care Curtis if he has a PS3 and why do you keep asking - give it a break man. Said another way "Plz, U hv sd nuf"
Hey Alek, I'm not nosey but, who you talking to? Alek replies at 07:15 - Yea, figured I'd do some top roof stuff before it gets too warm and the wasps come out - should be up there within the hour. Hey Alek.. Have you ever thought about playing music aoutside on halloween ? So it makes it more spookey ?? sorry bout blogging so much but j.w. if u were planning on putting on and off on seperete x10 modules again? not much going on todayy :( You putting anything up today alek ? Alek replies at 15:04 - I played Ultimate Frisbee today and am taking my youngest son to his baseball game in a bit ... so not much going up today. But I have been staging stuff, so expect a lot of action in the next few days as I try to have it all up by October 1st. halloween is the best i love it!!! Hello all you gooooolish komar goblins. Long time no write but it is time for the best decorations in the whole USA. Cannot wait!!! Alek replies at 21:30 - Those are actually pieces of plywood that act as bases for the inflatables. Even so, I have to put concrete pavers on top of 'em so they don't blow over! this is so mezzmerizing i keep forggeting to go out and decorate!!!! I made some good progress today with lots of help from my two kids, especially the younger one Kyle - another picture. And yes, I told him to be very careful with the (sharp) drill around the inflatables ... since ... IT IS ALIVE! Garage House Cam is ON - more happening this day? Alek replies at 08:48 - Yea, I've got a bunch of stuff "staged" in the garage ready to put out - will be doing so shortly on the front of the house, so I have turned on webcam1 for those that want to watch the deployment action. Crazy inflatable time at KOMAR. Is the Grim Reeper new? Grim Reeper is scary, but just went offline, please bring back. Hey Alek, what happened to the green inflatable skull ? it isnt up this year. Alek replies at 13:02 - You may recall that the Skull's fan motor blew out last year - see Halloween/2007 blog entry #184 and Christmas/2007 blog entry #159 - but I was able to do "Open Fan Transplant Surgery" from Elmo. I subsequently reversed 'em back for Christmas ... but now I have to switch 'em back yet again and get the Skull back out there on the front yard! Yipp**!!! 3 hours to go before the X10 controls are active!! yes all webcams on! i cant wait im so excited thank you alek for doing this every year! this is very cool. did you know Chris Pirillo got a HP Touchsmart? You're right, Optional...I see two timestamps too...top and bottom left....shout out from Fort Smith, AR! Alek replies at 16:23 - Oooops ... that is fixed now - thanks! Alek is voting open yet?? Where is the vote thing ?? I like the grim reaper BTW. Your fire fox update has finished alek !!!! whats up aleks kid wave to the camera!! You rock Dad! Everybody loves Halloween! Super exciting! I love the holidays at Komar . org! Alek, seriously you need to package this setup and sell it so others can do something similar!! Pretty awesome! what zone is the skull/pumpkins on the grass on? 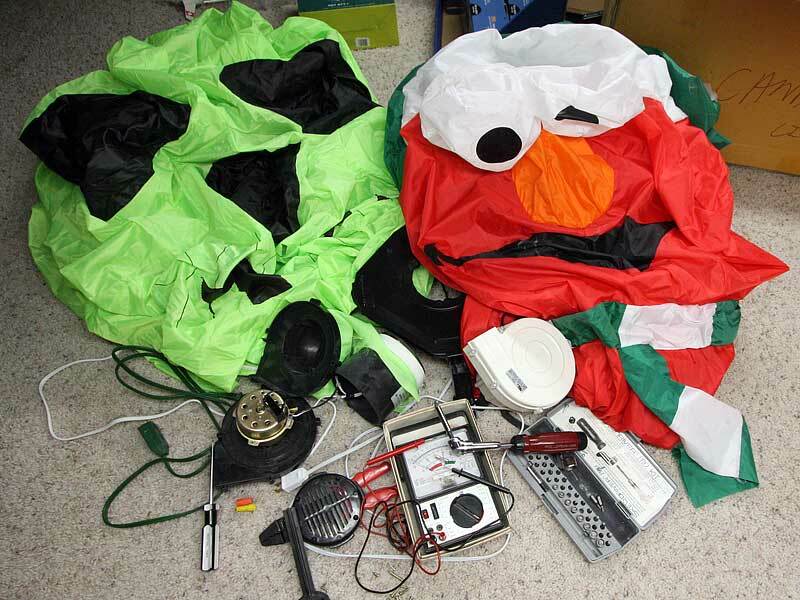 As a followup to post #118 below, "Dr. Kyle" and I were successful in our "Open Fan Transplant Surgery" from Elmo back to the Skull ... so that is now out there being inflated (and deflated) along with lighting up the front lawn. aren't you going to decorate the office alek? Alek replies at 17:16 - Probably won't be until after dinner - 7'ish or so. You look like Hulk's Mini-Me up on the roof in your green shirt! neigborhood kids gathering at ur sidewalk alek. Party on the driveway! It's a dry-run for trick-or-treating. So I was out playing baseball with my boys (picture of both of 'em) this evening. I was pitching and 7-year old Kyle was up to bat (note $3 sticker - garage sale purchase) ... and he SMASHES one to deep Center Field. But then he says "I cracked the bat Daddy" ... which he did - Game Over! I like the new addition of the daily votes for the prez candidates - HULK is gainging! At least the weekend is coming up...first of the month...probably can find a new bat at another garage sale!! Whoa Mr Grassoween, looks like you've got some serious competition there. You Colorado folk go all out. The neighbor's grass is nice too! And remind me never to mess with Mr Kyle. Tigger !!!!!!!! (I thought it was Grrrrrreat tony the tiger), is he an airblown with a fan so we can control him. LOOK WHO IT IS, BLOODY ARRABIATA, COME TO THE PARTY! the morning after many inflation/deflations and lights turned on/off the typical month of October. i cant belive how this quick this year has gone this is my 3 rd yr enjoying ur light show..
Alek replies at 16:40 - I usually don't do that, since with the daylight (it's hard to make the sun set sooner! ), you can't see the lights ... but it's a cloudy day, so sure, I'll turn it on an hour early tonight. Thanks for the great light show Alek, keep up the good work! To have fun while waiting for the lights to come on air go to gmvgames .com. A 14 Years old wesite. im getting a IPod nano 4g today!!! Alek UR ROCK MY SOCKS!!!!!!!!!!!!!!!!!!! alek what kind of laptop do you have! the night is over awwwwwwwwwwww! Alek replies at 09:08 - There's a "Small-Town USA" parade today ... so the HulkMobile is once again providing a ride for my kids' Cub Scout Troup - I'll try and get some pics - fun stuff! Update: Back from the parade which was a big hit - here's a closeup shot via the webcam. Whats brown and green and will smash puny humans..........The Hulk Mobile!!!!! The Hulk Mobile!!!!! The Hulk Mobile!!!!! Hey Its me again is there any chance of putting them on earlier again tonight because of it look dark - ish sorry about asking again its just the time you swiched them on I lost my internet conection! plus I love the hulkmoble! Here's a few pictures from the parade itself. My youngest son Kyle is in the front passenger seat whooping it up - there are half a dozen Cub Scouts sitting on back of the car behind the Hulk who is dressed up in patriotic garb - the scary looking driver is yours truly. The "banner" is actually a $4 sheet that has been spray painted and "attached" to the car with some of those mongo powerful magnets - worked pretty well. This is the third (fourth?) year I've driven the Hulkmobile for the Cub Scout Troup in the Lafayette Parade and it is a ton of fun! u took the hulk down from the Balcony?? can you turn on early please please please!!!!! Alec had two Hulks last year - will we see them togather this year? Thanks so much for doing this and the Christmas lights every year. I look forward to watching your cams around the holidays. I wish I had half the decorations you do. I LOVE to decorate! Not Christmas yet, but we're expecting snow in the Olympic and Cascades early this week (3,500 feet). Could be 2 to 5 inches. Alek replies at 20:50 - There was quite a Colorado Snow Storm two years ago over Christmas - several feet of snow - shut down the whole Denver area and airport for a couple of days! I remember 2006 and all the snow... and your neighbor "plowing" your driveway! That was the year I discovered your site! While it didn't get cold enough for snow last night (but maybe this weekend), there was a bit of rain - either that, or Frank and Homer were doing some serious partying and were hung over this morning! Note plywood bases and concrete pavers for stability - the eight foot inflatables really move around, especially if the wind blows. I was just noticing last year's Halloween pics....where is the 'rotating' pumpkin? Is that the one way out by the street? Alek replies at 12:48 - Yep ... at the bottom of the grass near the sidewalk ... top-left corner in webcam2. Alek replies at 14:19 - Find out tonight! REPLY To post 187 he put rope lights around them!!!! Alex i just would like to say what you do for Celiac Diese is cool. Thank you and keep up the good work. Isn't it time to go HD?? :) Need some high-def webcams... if they exist. So I walk out the front door to get the morning paper ... and a visitor last night left something on the driveway ... my guess it was probably a coyote. Note also the whiteness on the grass ... first frost ... and we may get snow this weekend. Wow thatss realy cool stroy about the coyote. Thanks for sharing. X10 on an hour early tonight - wooot - European people thank you Mr. Alek. hey alek do you have a time lapse when you decorated your office last night i didn't get to see? Love your site Alek! I look foward to this and your Christmas lights every year!I like the pictures you have here.Your son Kyle is adorable! I especially love the shot of the moon over the mountains! Awsome! As Chris noted in post #195, the Haunted Office is now mostly decorated. I'll take some higher quality pictures with my DSLR in the next couple of days, but here's some webcam snapshots plus a video time-lapse for 'ya. Note that Heads-Up Harry's eyes/mouth move (but his arms don't - bummer) and the "Brain Dude" is also kinda spooky. Hey Mr. G aka Halloween Dude. The office is coming along really nice and the skull is gonna be excellent to play with. Thanks for all your hard work. Alek replies at 16:23 - Just an FYI that it's quite annoying to use "ALL CAPS" (remember, this website is free) and normally that means I would not respond ... but suffice to say in this case, there are a number of reasons the other two webcams aren't online 7x24. Give it a break 068 and list HOW MUCH YOU ARE GOING TO DONATE to Celiac Disease. Hi! alek, this is the third year i see you decorations. You are the best. May I suggest you, if you can use, windows media enconder, for a live streaming, With your laptop and use the link on the page,??? is it possible, or it is more complex than that??. PD: post 191, was really made by an iss astrounat or is it fake?? I could tell you one reason he might not have them on 24x7 him and his family have the right to have there privacy. Alek replies at 20:18 - OK - here's the picture of the Haunted Office - Dirk was busy doing homework, and Kyle decided to ham it up for the camera. I also did some test shots of the outside of the house earlier - these are trickier because there is a very narrow time frame when the exposure is just right in the fading light ... plus it's nice to have some clouds in the sky - hopefully tomorrow! Alek replies at 20:04 - A little patience please ... it's a bit of work to take & then review the pictures taken. Unfortunately, the clouds dissipated shortly before the dusk light (sky looks much cooler with clouds) ... so I'll probably reshoot the house pictures ... but here's one of the Grim Reaper Motorcycle Dude taken an hour ago. Calm down Anonymous, I don't see you going out of your way to bring this kind of content to the whole world. Thanks Alek for the great show so far. Alek replies at 09:05 - Thanks for the kind words and glad you enjoy the holiday fun. My wife makes some great blueberry and/or chocolate chip pancakes using rice flour - they are better than the "real" ones. You can try some of my yummy BBQ grilling recipes. WHY WAS THE WEBCAM MOVED UP??? hey alek do you think you can post pics of halloween decorations is the house? It's really hard to see the laptop... what with Harry and the angle and such. Other than that I am once again loving the decorations and have been diligently spreading the word of Komar . org! The house and office both look especially good this year. Big thumbs up. Thank you for doing such an awesome job entertaining us puny humans. I can see the laptop, it's just a bit crowded and angled funny. Not complaining, though! You've outdone yourself this year Mr Grassoween. Very cool. Hey to da "Grass Crew". Sup? Hi to everyone.It's nice to see the lights again.Not been here much,luke had operation on ear and started secondary school.Do you know,it's not long until christmas! Alek,Your lights are really good this year,it's really kind of you to do this.I hope you raise lots for Celiac Disease Research. Well, mine are up! Tis the season! I swear Mr Grassoween, you're one of those guys who just keep on getting better and better looking with age! Not sure about the beard though. My wife won't kiss me when I grow one. Calls me "Cactus Face". Hi Sir Luke. How ya doing my friend? Hug the Royal Mum for me, would you? Well snowed here in northern nevada yesterday and last night not very much add up on the ground since the ground is still to warm. Think its to early for snow and the cold. Bring back the summer weather. Any chane of putting webcam 1 on please? Mr. G, are you guys expecting snow tonight? Looks like it has been raining all day and is only 39 degrees. Watch for slick spots on the roads tonight!! Alek replies at 16:03 - Definitely cold and raining ... and yea, if the temperature will drop just a bit more, we'll have the first snow as I suggested back in post #192. Since it's dark and dreary, I've set things up to turn on an hour early for the European Surfers. how complex is the coding for your website to talk with the x10? Alek replies at 17:39 - There is a bit of complexity pulling all this together - the FAQ covers some of it. Here's a picture of the front yard taken with a tripod mounted Canon 40D DSLR and 10-22mm lens positioned at the same location as webcam2 - bummer the D-Link doesn't have this good of image quality. Yours truly is standing between the skulls with a flashlight shining up into my face for a spooky affect. The red light in my left hand is the wireless remote that is triggering the camera. Shot at F/7.1, ISO 1600, and 0.6 second exposure which provides some motion blur on the passing car. How come you are not a link on EarthCam anymore? Hulk would make very good American President. couldnt you kep the inflatble pumkins or somethin on all day with controls? He only does that on Halloween Day itself (I think)..
Obama is kicking booty tonight - go Dems! Alek replies at 20:41 - Actually, there is an "Obama-Bot" that has electronically stuffed the ballot with over a 1,000 votes for the Democratic Nominee by a single IP address 68.150.179.247 which (ironically) is from Alberta, Canada. More info after the voting closes tonight and I'll be invalidating those votes. Ironically, in 2004, there was a "Kerry-Bot" that did the same thing. I guess Donkey's will do anything to win! Update: More info on the 2008 Bots page, but that IP Address cast 1,163 votes for Obama (in 25 minutes), 277 votes for HULK, and ONE for McCain. So I invalidated the Obama and Hulk votes which means that person cast just one vote ... for McCain - D'OH! ;-) Current Vote Totals are 6,716 for Obama, 7,484 for McCain, and 6,433 for the HULK - the Green Party Candidate needs to start making a SMASHING comeback! Canada man isn't even supposed to be voting for an American President. A much stronger frost this morning than a week ago (see post #192) but no Coyote Poop on the driveway this time, nor any snow yet ... with a warming trend for the rest of the week. Looks like the Witch is huddling under the Grim Reaper Motorcycle Dude to try to stay warm. Great display, Hulk has my vote, Go Green! I only lick it because i can Mom! Fantastic Picture Mr G with the Camera. Really shows the colours up. Well, sho nuf it didn't work, so i just tell you stretched out, I made some nice Halloween printable greeting cards that you can print and the name of the website is PrintPicnic dot com. This isn't meant for advertising. Hey alek do you think you can post more pics? Alek replies at 19:51 - How 'bout this SMASHING picture of the front of the house?!? Were are all of your pics. you usally have 20! Scroll down the Blog Dylan and count how many great pictures there are! what does the hulk think about the decorations? Alex, how are you? This is the "Greeley Grizwald". Great job on your Halloween display. I hope your family is well. Chat with you soon. I had some fun taking this picture tonight. Please note that no lights are on ... except for the full moon to the left per the shadows. This is a tripod-mounted 30 second exposure (you can see star trails in the hi-res original) so I had time to "draw" a BOO free-hand with a blue LED light and then turn a flashlight on myself. Update: Here's time-lapse footage that shows the shadows from the full moon. Glad to see your set up is up early! Love coming on here every year :). Happy Halloween! Cheers from UO ducks. Alek replies at 07:54 - I did have my snowman ... uhhhh ... vandalized (!) in 2002 ... but fortunately, the biggest source of destruction is squirrels chewing on the wires. This summer, a neighborhood kid knocked over my trash can thinking he wasn't being watched - LOL! ;-) The webcams run 7x24 (even when the web page shows them offline) with archive footage, so lets hope there are no Grinch'es out there. Alek replies at 10:15 - If you can make the sun go down sooner (so it's dark and the halloween lights are visible), I'd be all for turning things on early! I do sometimes turn it on early (especially if a cloudy day), but it's going to be darn sunny for the week - sorry. Inflated Pumpkins are good. Leave them on during the day. I too wish for early light turn on. As always, this is awesome and inspiring! It reminds me how much I miss Boulder and all the incredible people. Happy (early) Halloween! Lady just drove off in the red car - she was hot! Secret Service has showed up in black SUV in front of the skulls. Hello from Computer Juice Alek. Love the photo at 266. Very spooky. Alek replies at 21:02 - Thanks for the kind comment and glad you enjoy the show. Wow!! 340 people viewing right now! Is DIGG here again? Alek, I sometimes get a flashing square of code pop up. Does your site not like vista business? Alek replies at 21:28 - I haven't actually tried it under Vista ... but nobody has ever reported anything like this - you sure this isn't just related to the animated cursor? Greatest ... WebSite ... Evar! what date do you put your xmas decorations Up ? I've been coming to Komar for years. He has Xmas up by Dec 1. 2 hours, 20 minutes before lights on. Watching what people say on the Halloween Instant Messages is often quite entertaining ... and if I happen to see something funny, I'll try to add some levity. In this case, the HULK says "No Blatz for Puny Humans!" You should consider entering our Halloween Contest. This year Aristotle Design is hosting a Memphis Inspired Halloween Costume and Party Idea contest. The grand prize is a weekend getaway in Memphis, TN. Details about the contest can be found on our Halloween Site: LINK DELETED The contest will end on Nov 6th and winners will be announced on Nov. 10th. Sounnikoura is ninjaing your comment 300! Im voting for the big green guy im not infavor of the other 2!!!!! alek how come Grim Reaper is teyed down??? Super-simple do-it-yourself costumes - with ideas and instructions for: Spider-Man, Hannah Montana, Barack Obama, John McCain, Sarah Palin, Joe Biden, Brittney Spears, Pirate, Dr. House, Raggedy Ann and Andy and much more. Find the answers at LINK DELETED. Univ of Maryland Center for Celiac Research. does anyone else in your street decorate the same as you do ? This is a great web cam and very family friendly, we look foward to it on the holidays, I email this site to all my family and friends. The Rocky Mountain News has endorsed Hulk, the Green Party Candidate, for President. And yes, that's a real screen shot of their web site - condensed below for viewability, but click on it to see full-size. i was controlling the lights and was watching them blow up and down does that not brake the motors doing that all the time ? That must cost a fair bit running those lights,what with the fuel bills etc.Good on you Mr G.
Alek replies at 19:25 - It's a common misconception that the halloween display uses a lot of electricity. It's actually about a dollar/day - see the detailed circuit layout/electrical analysis on the main webcam page. Alex is the halloween display is about a dollar a day, is the chrismas display around three or four dollars a day????? Alek replies at 13:27 - It depends on how many lights ... or actually, how much amps are used ... plus the Christmas display is on for another hour since it is darker that time of the year. You can see last year's electrical analysis - ran about two dollars/day - my guess is 2008 will be similar. If anyone is in Rochester, NY I can recommend an really good haunted house called Nightmare Manor. Really scary and worth going to. Their website is LINK DELETED if anyone wants to check it out! Hulk is in the lead now for President. "Total Votes: Obama:11,404 McCain:11,649 HULK:11,923"
Great Halloween Show. Hulk for Prime Minister. whats with the string alek? Alek replies at 17:15 - We have some weather coming in, and the wind knocked the lighted Frankenstein off the top roof ... so it was hanging by the power cord. I put 'em back up there - let me know if he falls again. Alex Komar's Great Halloween Display - on in an hour! Alek replies at 17:55 - Yea, it's blowing pretty good out there - inflatables are whipping all over the place - you may also see webcam1 bounce up and down a bit. The temperature is dropping - may see snow tonight, but I think doubtful. The grass-roots support of "Hulk for President" continues to grow after the Rocky Mountain News endorsement - watch the New Channel 3 video segment. Great newsclip for Hulk. When will he be on CNN? Good! I'm from Poland. I like Halloween. "Grass" roots support for Hulk for President. Hmmmm. Well, he's got my vote. Anyone know who he has chosen for the VP position? I've had some people point out that you can see what is on the roof during the day because of the shadows they cast. In addition to a row of pumpkins on the very top, there are two Hulk's on the balcony with one wearing a red, white, and blue hat. Here's a nifty time-lapse video of it. No demons here Mr Gloryman. Although after a couple of PBR's Alek does turn into a little devil. mr g, the site says it's my first visit here. made me sad. it's the ip address, eh? stupid 3g modem. Blog Post #97 shows me up on the roof installing halloween decorations - yes, I'm careful up there. But another hazard is wasps - here's a closeup shot from when I was installing the LED icicle lights above the garage ... and one got me! I've had run-in's with these guys before as these wasps like my peaches. how do you get the hulk and homer thing off? That is a great picture. Kyle is a puny human compared to Grim, Frank, and Homer. Hi There again ! The picture below is great and the icicle lights are amazing as they are really colourfull. will you be uploading more light pictures and so on to the blog as i would love to see more and would also love to see pictures of the people coming and going at halloween. THanks so Much if you answer !!! Earthcam has mentioned this site in their 2008 halloween displays - consider casting a vote for HULK here! Cameras aimed at your house and yard, broadcast live on the internet. Oh wait, he's got that one covered. really love this site on it mostly every night keep myself away long enough !!! really love the pic below the way it has captured the icicle light :-). cant wait till yer xmas decs go up in about 22 days as last year you started to put them up on the 16th of november so im going by that great stuuf keep it up.! alek !!!!! was looking at your cam what wrong with your roatating pumpking ? it doesnt seem to be blown up as well at the other ones !! takes a while and even at that it doesnt really go up :-( Awww Poor pumpkin !. Tonigh at 10:00 pm. Alek will try to summon up the spirit of Bloody Mary, to prove that she does not take the lives of those saying her name in front of a darkened mirror. Appreciate the kind words and funny comments. #356: Yea, the rotating pumpkin got twisted again and it takes a bit of work to fix - I'll try to fix before it gets dark. WRT Vandalism, one can only hope some jerk doesn't come by and mess up holiday decorations that are up for charity. Plus I got the Hulk Twins watching (closeup and real closeup) along with other spooky things. Mouse over for HULK Closeup! What are the Hulks made of? Are they inflatable or like a hard plastic or something? There were a number of kids/families that have come by so far tonight - I told 'em to be sure to come back on October 31st ... even though some were already dressed up. These two boys had an especially good time using the X10 remotes to turn stuff on & off ... battling Internet users for control of my house! Hey Alek! Absolutely love the site. I was just wondering out of curiosity...do you enjoy decorating for Halloween or Christmas more? And which season do you like better? Alek replies at 07:17 - Christmas is more traditional for decorating, but I enjoy the spooky aspects of Halloween and the trick-or-treating ... so I like 'em both. Along those lines, commenting has been re-enabled on the Christmas Blog. I wandered over to my (great) neighbor's house tonight for a few Canon 40D pictures to compare to the D-Link DCS-6620G that is webcam1. These two pictures were taken at the same time - maybe Santa will bring me a better webcam for Christmas! be lucky for what you have. Komar does a great show for another year. I cant' see how clicking on one of the boxes to turn the lights on and off are considered ballot stuffing? you see the lights go on, you click off. same for on. Hour to go for lights on. Big day in 4. Is That A IBM Thinkpad you are using? Alek replies at 19:17 - I recently swapped out my IBM Thinkpad for an old Dell Latitude 3800 that has a 750 MHz Pentium III with 512 MBytes of RAM running Ubuntu 8.04 - picked up via Craigslist from a nice guy in Erie, Colorado. Firefox 3.0.3 (with ReloadEvery extension) is used to display the IM's, and an X10 Firecracker sends the on/off commands to the decorations via the serial interface. Is David Banner running for Vice President? I was going to suggest Diana Prince for VP. WOW - it doesn't get much closer than that! Lets Hope the Outcome of the Election does not divide our Country. Yooooo 377, it is not a "huge margin" - read post 375 - 9 vote difference with over 45,000 votes cast ... plus the Green Party Candidate is close too. Don't get the Hulk angry as he might come and haunt you! Alek replies at 12:54 - Yikes ... we got the inflatable fashion police after us! Rest assured that there will be some extra "stuff" this Friday on Halloween Day. Along those lines, I did a little maintenance in preperation and just replaced the X10 Super Socket in the Garage. Remember that X10 is typically used to turn lights on at dusk, and off at dawn ... rather than thousands of times a night like Internet Surfers are doing to my halloween display. So sometimes they blow out - listen to what that sounds like along with an explanation from me. Hi Alek Just a Thought i was looking at the getting ready for christmas 2008 web page and i so that you had wrote "you were thinking of putting a 4th web can in but didnt know were to put it" why dont you put it on the chimney on the roof? so we get a birds eye veiw of the lights from the roof. Who says just because the big man has a sleigh and 9 reindeers he should only get a roof top veiw. Thanks !! ALEK HOW DID YOU MAKE THIS WEBSITE ????? Yikes that picture of you in front of the clock is freighting . You look like a Troll that just crawled out from under a bridge. I Love the Ears. Are you sure you are not a Vulcan? My kids love this great site. I can't wait until Halloween and then Christmas. I live in a family neighborhood, and needless to say, the crazy Halloween Decorations attract lots of trick-or-treaters. In fact, I spend a more for goodies than on electricity (~$30/month) for the display. In addition to treats for the kids (yes, not approved by the American Dental Association), I pass out dixie cup shots of Port, Bailey's, or Whiskey Egg Nog for the adults - similar to last year. Temperatures will be unseasonably warm this Friday, so expect a big crowd - it's a ton of fun! Komar is giving away Christmas Candy at Halloween - LOL! And you thought he just bought lights and decorations at the after Christmas markdown sale. While Frank and Homer tend to get most of the attention (especially because they are 8+ feet tall), lets not forget some of the smaller "members" of the display. SpongeBob Squarepants is a huge hit with the little kids ... and no Halloween display would be complete without a Witch. Hi Alex, I would'nt mind a baileys please. The weather is unseasonably cold here in good old blighty -3 last night. I have just finished decorating the interior of my house for halloween party. Alek i saw the bit earlier on were you were saying that you get lights after christmas in the sales. Over in colorado do they also put the inflatables on sale ? as in the uk they dont tend to get reduced that much after xmas :-( only the lights do !!! What is hamburger? Chopped steak! Make your hamburger taste like a STEAK burger with A1! Alek replies at 20:01 - I do a nightly analysis of the voting patterns and if someone is trying to electronically stuff the ballot, the votes are invalided - read more here - but there are at least two McCain-Bots so far tonight! Here's what the Halloween Display looks like as you drive by - a bit crazier in real-life with 9,000+ lights going on & off along with inflatables going up & down - closer view. The second picture is the giant pumpkin next to the sidewalk - the stuff inside actually rotates ... when it doesn't get tangled up! Has anyone see any really clever costume ideas this year? I saw one woman dressed in a football jersey and high heels-she was "fantasy football"
yeehaa, i'm off to this year's first halloween party. two more tomorrow. does anyone have a spare liver? Hi Alex, Hope you have and your family have a great night and lots of trick or treaters....HAPPY HALLOWEEN..
Angela from Menston, Ilkley, UK likes hulk gggggrrrrrrrrr.. George likes the colours and piggy wants to control the lights!!!!! hello from James rabert robinson ! The temperatures should set a record high today with the warmest Halloween ever ... so expect a LOT of trick-or-treaters tonight. Here's what they'll see as they walk up the driveway. I've turned the halloween text messages on early. This is Lewin from the other side. Tell Nancy not to worry I will see her soon. have a nice halloween from Spain! tomorrow when you take down the decs? can you upload photos of you taking them down so that we get to see how they come down like what you do at xmas !! Happy Halloween everyone! And a big pat on the back to our fabulous host Mr Alek. I think he's outdone himself AGAIN. Thanks for all your hard work. It's been a blast! Now let's sit back, eat some candy corn, and watch all the Halloween action. Got a feeling it's going to be outa control!! Hey Alek, Looking at the office cam, you don't look too good, why you holding your head? 2702 people viewing Halloween Decorations. I told you it was going to be outa control! Alek replies at 00:56 - Yep - it was totally outa control - web server struggled a bit, but hung in there well despite the heavy traffic. can anyone tell me what steak sauce tastes like,is it bbq or like UK brown sauce???? Awesome stuff. Great work as always. WOW - what a fun night. Over 200+ trick-or-treaters almost cleaned me out of candy as I was too generous early on. I also passed out plenty of shots of Bailey's, Port, and Egg Nog Whisky. And then there were a LOT of web surfers who surfed on by. I've uploaded some time-lapse halloween movies of the action. Typical of the trick-or-treaters that came by are these two kids of some great friends. Frankenstain Jeffrey (standing before his name sake) with a pirate booty bag and his brother Punk Rocker Drew with rockin' guitar. I'll probably leave the webcams and X10 controls up one more night - heck, we gotta vote for Obama, McCain, or the Hulk. But then Halloween is over and it is time to get ready for Christmas. Loads of kids were out for halloween in my home town of clitheroe in the uk. It was good to see so many trick or treaters enjoying themselves. I hope you celebrate All-Saints Day with your neighbors...because they are truly all saints to live in harmony with all this action! I don't think it could happen where I live! Thanks for the fun! Alek replies at 17:23 - Neighbors think it is a hoot - their kids love it. Alek when are you putting up the xmas decorations and taking down the halloween ones? Alex did you pick up anything at any after Halloween sales? and if yes can you please tell us what we could expect next year? well, im sure that there were quite a few vote stuffing tonight on both sides..
Alek replies at 22:16 - Yea, there was vote stuffing tonight on all three sides - I am checking the votes ... results soon. 23:27 Update: After tossing out the invalid votes, Obama wins with 21,966 votes, McCain is a close second with 21,821, and Hulk has 21,692 - here are the daily results. I was surprised how close it ended up being and it was a fun little contest - we'll do it again in 2012 ... and yes, the Green Party Candidate plans to come back and be SMASHING! In the meantime, get out and cast a real vote for your choice for president! Goodbye, halloween '08. I will miss you so. Oh well, here comes Christmas! Halloween was so fun!!! thanks alek for doing this!! ): now we have to wait another year.... It was good. Thanks for the enjoyment everyone. 511 comments in 2007 lets try and get more than that come on you can do it !!!! Alek replies at 13:46 - If people have something noteworthy to say, feel free to chime in, but lets not try to hit a certain number - we did fine and had fun with the halloween blog in 2008 ... which I'll be turning off in a few days anyway as it is time to get ready for Christmas. With help from my oldest Son Dirk, we got 'em stacked up nice and neat - ready for Halloween 2009! Is that another inflatable skull mr g ??? Alek replies at 18:04 - Nice Spot ... yea, it was 75% off ... plus I have had to do "open-fan transplant surgery" between the Halloween Skull and Christmas Elmo ... so decided to pick it up. does the coor light light up? So Obama is our new president. woot woot!!!!!!!!!! Thanks again Mr Grassoween for a fun Halloween. You da Man!! Cant wait to see next years halloween with all That stuff you got at the sales !!! Halloween 2008 was again a lot of fun (too bad the Hulk didn't win the Presidental Election), but all good things come to an end, so I'm turning off blog comments until next September ... come back for halloween 2009. The christmas blog is open for comments and the christmas lights will go up in a few weeks and I hope to have the christmas lights webcam LIVE after Thanksgiving.